Mutations in NPHS1, which encodes nephrin, are the main causes of congenital nephrotic syndrome (CNS) in Finnish patients, whereas mutations in NPHS2, which encodes podocin, are typically responsible for childhood-onset steroid-resistant nephrotic syndrome in European populations. Genotype–phenotype correlations are not well understood in non-Finnish patients. We evaluated the clinical presentation, kidney histology, and disease progression in non-Finnish CNS cases by mutational screening in 107 families (117 cases) by sequencing the entire coding regions of NPHS1, NPHS2, PLCE1, WT1, LAMB2, PDSS2, COQ2, and NEPH1. We found that CNS describes a heterogeneous group of disorders in non-Finnish populations. We identified nephrin and podocin mutations in most families and only rarely found mutations in genes implicated in other hereditary forms of NS. In approximately 20% of cases, we could not identify the underlying genetic cause. Consistent with the major role of nephrin at the slit diaphragm, NPHS1 mutations associated with an earlier onset of disease and worse renal outcomes than NPHS2 mutations. Milder cases resulting from mutant NPHS1 had either two mutations in the cytoplasmic tail or two missense mutations in the extracellular domain, including at least one that preserved structure and function. In addition, we extend the spectrum of known NPHS1 mutations by describing long NPHS1 deletions. In summary, these data demonstrate that CNS is not a distinct clinical entity in non-Finnish populations but rather a clinically and genetically heterogeneous group of disorders. NPHS1, encoding nephrin, was identified by positional cloning more than a decade ago and is the major gene involved in CNF in Finnish populations (98% of cases).12 The Finmajor (c.121delCT; p.L41fs) and Finminor (c.3325C>T; p.R1109X) mutations account for 78 and 16% of the mutated alleles, respectively, in Finnish cases12; however, these mutations are rarely found in other ethnic groups.13 NPHS1 genetic screening in patients of non-Finnish origin has shown that the frequency of NPHS1 mutations is lower than that in Finnish patients, with such mutations accounting for 39 to 55% of cases.14,15 Indeed, more than 140 different mutations have been identified among non-Finnish cases,14–24 including protein-truncating nonsense mutations, frameshift small insertion/deletion mutations, and splice-site changes.14–24 In vitro functional assays have shown that most NPHS1 missense mutations lead to retention of the protein in the endoplasmic reticulum,25,26 resulting in a complete loss of nephrin from the cell surface. This suggests that defective intracellular nephrin trafficking, presumably as a result of protein misfolding, is a common consequence of the NPHS1 missense mutations implicated in CNS. Nephrin is a transmembrane protein of the Ig superfamily characterized by eight C2-type Ig-like domains and a fibronectin type III repeat in the extracellular region, a single transmembrane domain, and a cytosolic C-terminal end.12 The extracellular domain of nephrin forms homodimers and heterodimers with NEPH1.27,28 Nephrin–NEPH1 interactions control nephrin signaling,29 glomerular permeability,30 and podocyte cell polarity.31 Neph1 knockout mice present massive proteinuria within the first 2 weeks of life and renal lesions resembling CNF in humans,32,33 suggesting that recessive inactivating mutations in the NEPH1 gene may be involved in congenital human glomerular disease; however, no mutations have yet been identified in this gene. These clinical associations confirm the genetic heterogeneity of CNS in non-Finnish patients. It remains unclear whether subtle differences in phenotype between patients who have CNS and bear NPHS1 or NPHS2 mutations could be used to guide genetic screening. Distinctive extrarenal clinical features certainly help to direct mutational screening among patients with syndromic forms of CNS; however, patients with nonsyndromic CNS may have mutations in the WT1, LAMB2, COQ2, and PDSS2 genes, making genetic screening more difficult and time-consuming. Finally, the contribution of NEPH1 mutations to CNS has never been explored. We therefore carried out a comprehensive genetic analysis in the largest multiethnic cohort of patients with CNS of non-Finnish origin reported to date, with the aim of defining the epidemiologic role of mutations in the main genes implicated in CNS and elucidating potentially novel genotype–phenotype correlations. In total, 117 patients from 107 families were included in this study (Supplemental Table 1). We classified 49 of these cases as sporadic; the remaining 68 cases (58 families) were considered familial. Most families originated from Western Europe (56%), North Africa (18.7%), and Turkey (9.4%). NS was detected during the first 3 months of life in all cases (median 4 days; range 0 to 90 days). Age at NS onset was similar in male and female patients (median 4.5 versus 4.0 days, respectively; nonsignificant). 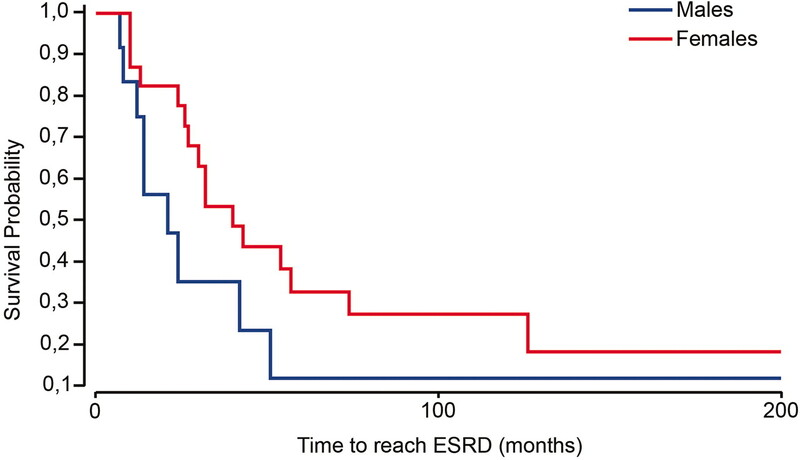 ESRD was reached in 58 patients (median 24 months; range 0.5 to 204.0 months), and an additional 14 patients underwent preemptive nephrectomy followed by dialysis or transplantation (median 10 months; range 6 to 60 months). Extrarenal abnormalities were observed in 16 (13.7%) patients. Evaluation of the response to angiotensin-converting enzyme inhibitors or indomethacin was hampered by the limited clinical information available. Twenty-five (21.4%) patients died during follow-up, most during the first year of life (survival probability at 12 months = 0.79; 95% confidence interval 0.72 to 0.87). Mutations were identified in 87 families (81.3%; 95 cases). Affected patients from 60 families (56%) had homozygous or compound heterozygous mutations in the nephrin gene (Table 1). Affected patients from another five families had only one mutated allele. In two of these families, a nonsynonymous single-nucleotide polymorphism was identified in the other allele (p.P264R and p.R408Q). Overall, we identified 62 different NPHS1 mutations (26 were novel and included 32 missense mutations, three insertions, 12 deletions, two insertion/deletions, and six nonsense and seven splicing mutations [Supplemental Table 2]). A homozygous deletion extending from the boundaries of exon 12 to exon 22 (c.1441-?_3109+?) was detected in one case. A 36-bp deletion (c.1758–8_1784del36) including parts of intron 13 and exon 14 was found in another patient. We found that 77% (n = 24) of missense mutations were located within an Ig-like C2-type domain. In addition, one mutation affected the fibronectin type III domain, and another nonconservative substitution involved the second amino acid of a putative N-glycosylation site (p.V709G). Only one missense mutation affecting the cytoplasmic domain was detected, and no mutation affecting the transmembrane domain was identified. Finally, five missense mutations were localized outside known functional domains. Patients with nephrin mutations presented NS early in the congenital period (median 2 days; range 0 to 60 days). An analysis of phenotype as a function of nephrin mutation showed that age at NS onset was similar in patients carrying two missense mutations, one missense plus one truncating mutation, or two truncating mutations (median onset 1.0, 1.5, and 2.0 days, respectively; nonsignificant). Surprisingly, the location of mutations within the nephrin gene had a significant influence on the age at which patients developed NS, with disease onset later in patients with two mutations in the cytoplasmic domain than in patients with two mutations in the extracellular domain (median onset day 14 versus day 1; P = 0.028). Among patients without mutations in the NPHS1 gene, 16 families (14.9%; 20 cases) had mutations in the podocin gene (Table 1). The p.R138Q mutation accounted for 50% of the mutated alleles and was found in the homozygous state in nine affected patients from seven families. Five patients from three unrelated families (two from Comoros Island and one from Saudi Arabia) had a homozygous p.V260E substitution,34 the second most common mutation in patients with a mutated podocin gene and CNS. In two unrelated cases, we identified a pathogenic mutation in one allele, in compound heterozygosity with the nonsilent polymorphism p.R229Q, an association that has been mainly described among patients with juvenile-onset SRNS.52 Finally, truncating mutations of the podocin gene were found only in two unrelated families. Age at NS onset (median 29 days; range 0 to 90 days) and disease progression were highly heterogeneous among patients with podocin mutations. Patients with homozygous p.R138Q mutations presented NS quite late in the congenital period (median 2 months) and generally progressed to ESRD after the age of 5 years (median 79 months; range 24 to 159 months), whereas patients carrying the p.V260E mutation had an earlier age at NS onset and progressed more rapidly to ESRD (Supplemental Table 1). Patients with the p.R229Q variant developed NS in the first month of life; however, they progressed slowly to ESRD. Thus, one of these patients did not reach ESRD until 16.3 years of age, and another remained free of chronic renal insufficiency 65 months after birth. Mutations of the WT1 gene were found in two patients (Supplemental Table 1). Two patients with DMS and rapid progression to ESRD had PLCE1 mutations (Supplemental Table 1). In one of these patients, a single heterozygous mutation (p.R408I) was detected, along with two common polymorphisms (p.R548L and p.R1575P). PolyPhen software–based in silico analyses predicted that both variants identified would result in nonconservative amino -acid substitutions that probably would be damaging; however, both variants have been identified in control Caucasian populations (HapMap-CEU), and it therefore seems implausible that they play a role in the pathogenesis of NS in these patients. Mutations in the LAMB2 gene were found in two unrelated children presenting typical Pierson syndrome. Analyses of the COQ2, PDSS2, and NEPH1 genes identified no mutations. Thus, in 22 (19%) patients from 20 families, no mutated gene was identified. Four of these patients had severe psychomotor impairment, one presented spontaneous complete remission, and another two developed recurrence of proteinuria after transplantation. Because podocin and nephrin mutations accounted for the phenotypes of 76% of the patients with CNS from our cohort, we tried to identify significant clinical differences between patients with mutations in the NPHS1 or NPHS2 gene (Table 2). NS was diagnosed earlier in patients with nephrin gene mutations than among patients with podocin gene mutations (median 2 versus 29 days; P = 0.001). Moreover, 74% of all patients presenting NS during the first week of life had nephrin mutations, whereas only 11% carried mutations in the podocin gene (P = 0.002). Conversely, podocin gene mutations accounted for 37% of patients in whom NS began after 1 month of life, whereas nephrin gene mutations were less frequent (n = 3; 16%) in this group (P < 0.001). Most of the kidney biopsy specimens from patients with nephrin mutations were consistent with CNF (82%; Table 3). No association was found between the presence of PTD and age at NS onset (median onset 2.5 versus 2.0 days, PTD versus no PTD; nonsignificant) or the age at which renal biopsy was performed (median 2.8 versus 1.0 month, PTD versus no PTD; nonsignificant). PTD was also observed in two patients with single NPHS1 mutations and in a patient with a mitochondrial disorder (deficit in complexes II and V). PTD was also reported in two patients with homozygous missense mutations in the NPHS2 gene (p.V260E and p.R168H, respectively) and four patients in whom mutations were not detected. In patients with mutations in the NPHS2 gene, minimal glomerular changes (n = 6) and FSGS (n = 5) were the most common histologic features. DMS was not observed in patients with nephrin or podocin gene mutations. Fourteen patients underwent preemptive nephrectomy: 11 had nephrin mutations, one had mutations in the podocin gene, and two had no known mutation (nephrin versus podocin, 11 of 66 versus one of 20, respectively; P = 0.28). This observation suggests that clinical course is less severe among patients with podocin mutations. Excluding patients who underwent nephrectomy, patients with nephrin mutations had shorter renal survival than patients with podocin mutations (median time to ESRD 32 versus 79 months, nephrin versus podocin; P = 0.007; Figure 1). For the cohort as a whole, no differences in kidney survival as a function of gender were identified; however, stratified analysis revealed that, within the subgroup of patients with nephrin gene mutations, renal survival tended to be better for female patients (median time to ESRD 21 versus 40 months men versus women; P = 0.07; Figure 2). Survival did not differ between patients with nephrin and podocin gene mutations. Kidney survival is greater in patients with podocin mutations compared with nephrin gene mutations. Kaplan-Meier survival curve shows the proportion of patients who had NPHS1 or NPHS2 mutations and remain free of ESRD. We excluded patients who underwent preemptive nephrectomy, patients with mutations in other genes, and patients in whom mutations were not identified from the analysis. Red line, patients with NPHS2 mutations; blue line, patients with mutations in NPHS1. Kidney survival was significantly better among patients with NPHS2 mutations (time to reach ESRD 79 versus 32 months, NPHS2 versus NPHS1; Wilcoxon test P = 0.007). Female patients with mutations in the NPHS1 gene seem to show improved kidney survival compared to male patients. Kaplan-Meier survival curve shows the proportion of male and female patients who had mutations in NPHS1 and remained free of ESRD. We excluded from the analysis patients who underwent preemptive nephrectomy. Red line, female patients with NPHS1 mutations; blue line, male patients with NPHS1 mutations. There is a trend toward better kidney survival among female patients (time to reach ESRD 21 versus 40 months, female versus male patients; Wilcoxon test P = 0.07). In our cohort, 21 patients (from 21 families) remained free of ESRD at the age of 5 years. Nine of these patients maintained a normal GFR after the age of 10 years (Supplemental Table 1). No modifier effect of gender was observed. Four of the patients with normal GFR after the age of 10 years had nephrin mutations—homozygous p.R1160X (two patients), p.R1160X + p.R1109X, and p.R367C + p.R743C—four had podocin mutations (including the p.R138Q mutation), and one had no mutation. Eight families displayed broad intrafamilial phenotypic variability (Supplemental Table 1). Indeed, in one family with NPHS1 mutations (p.R586G in the homozygous state), two siblings presented atypical CNS characterized by mild edema, no need for albumin perfusion, and an absence of chronic renal insufficiency 44 and 74 months after birth, respectively, whereas a third sibling had SRNS and FSGS, detected incidentally at the age of 7 years. In five families with mutations in NPHS2, several additional siblings presented infantile or childhood-onset SRNS. Finally, in another two families, no mutations were detected. One of these families contained three male siblings with CNS and one female sibling with late-onset FSGS, suggesting an X-linked disorder or that gender had a modifier effect. Sixteen patients with various extrarenal abnormalities were included in our cohort (Supplemental Table 1). We identified two patients with Pierson syndrome and one patient with genital abnormalities as a result of mutations in the WT1 gene, but no other associations between genotype and extrarenal symptoms were found. Mental retardation, microcephaly, and cardiovascular abnormalities (atrial septal defects and pulmonary artery stenosis) were the most common findings. A small proportion of patients with nephrin or podocin gene mutations presented extrarenal abnormalities, none of which could be accounted for by mutations of these two genes. Three patients with nephrin gene mutations had congenital heart defects, whereas none of the patients with podocin gene mutations presented cardiac abnormalities. We conducted comprehensive genetic screening for pathogenic mutations in the largest multiethnic cohort of patients with CNS studied to date. Isolated CNS has generally been regarded as a single, distinctive clinical entity, but our findings demonstrate that CNS is actually a clinically and genetically heterogeneous group of disorders in non-Finnish populations. We confirm that mutations of the nephrin and podocin genes are involved in CNS, but the proportion of cases attributable to mutations in each of these genes varies significantly with age at NS onset within the congenital period. Most patients in whom the disease began in the first week of life had mutations in the nephrin gene, whereas mutations in the podocin gene were the main genetic cause of CNS in patients in whom NS began more than 1 month after birth. The correlation between genotype and phenotype reported herein may account for the findings of Hinkes et al.14 for the subset of patients with CNS (age at NS onset 4 weeks), which revealed that 51% of the patients had mutations in NPHS2, whereas NPHS1 mutations accounted for only 34% of the patients. Our findings are also consistent with those of Patrakka et al.,53 who showed that NS was diagnosed within the first week of life in 82% of the children who had CNF and carried nephrin mutations. We identified 62 different mutations in the NPHS1 gene, 26 of which had never before been described (Supplemental Table 2). We also report, for the first time, long NPHS1 deletions. The Finmajor and Finminor mutations were found in only two cases, confirming their relative rarity in non-Finnish populations.15,17 In our cohort, a single mutated NPHS1 allele was identified in five families. Interestingly, in two of these families, we detected a pathogenic mutation in one allele and a polymorphism in the other (p.P264R and p.R408Q), whereas no mutations were found in the other genes subjected to mutational screening. The p.P264R polymorphism has already been implicated in CNS,19 whereas an association of p.R408Q with NS has never before been reported. These two variants affect the third and fifth Ig-like C2-type domains, respectively, and involve nonconservative amino acid substitutions affecting residues highly conserved throughout evolution. In addition, the substitution of a proline residue for the arginine residue in position 264 may affect the stability of the disulfide bond between the cysteine residues in positions 265 and 317. Screening of 100 control subjects showed these two variants to have minor allele frequencies of 0.021 and 0.037, respectively; however, no control subjects who were homozygous for these variants were identified or have been reported in the single-nucleotide polymorphism database. The pathogenicity of this association is difficult to assess, although it is reminiscent of observations in patients with SRNS and NPHS2 mutations, in which compound heterozygosity for one pathogenic mutation and the p.R229Q polymorphism invariably led to proteinuric glomerular disease,52 of congenital onset in some cases, as in two patients from our cohort. Mutations in the podocin gene were found in 15% of the families and were more common in patients in whom NS began after the first week of life. The p.R138Q mutation accounted for 50% of the mutated alleles. These results confirm previous associations between the p.R138Q mutation and early-onset NS.34,54,55 Contrary to previous reports,54 we identified truncating NPHS2 mutations in only two families, possibly as a result of the ethnic differences between our cohort and previous reports,54 and the high frequency of the European founder mutation p.R138Q among our patients. Renal histology was nonspecific in patients with podocin gene mutations, most of whom displayed minimal glomerular changes or FSGS. Because PTD was detected essentially among patients with mutations in the nephrin gene, this condition may be useful for differentiating between patients with podocin gene mutations and patients with nephrin gene mutations. The detection of PTD did not depend on the age at which kidney biopsies were performed or age at NS onset. Another surprising finding of the analysis of our cohort was the substantial difference in disease progression between patients with nephrin or podocin gene mutations, because the second group of patients clearly had a better clinical outcome. This observation is consistent with the classical phenotype of patients with mutations in NPHS2, in whom ESRD generally develops between the ages of 6 and 9 years.34,54 In addition, we found indirect evidence of differences in disease severity. Thus, most of the patients who underwent preemptive nephrectomy had nephrin gene mutations; however, this evocative clinical finding was not statistically significant because of the small number of patients who underwent nephrectomy. CNS has classically been regarded as a rapidly progressing glomerular disorder leading to ESRD by the age of 2 to 3 years.15 In our cohort, we identified 21 patients who had not reached ESRD by the age of 5 years. Furthermore, nine patients had partial or completely preserved GFR at the age of 10 years. A subset of patients with CNF and a milder clinical course were described by Koziell et al.19 Most of those patients were female and carried homozygous NPHS1 p.R1160X mutations, consistent with a modifier effect of gender. We recently reported that childhood-onset SRNS may be associated with mutations in the NPHS1 gene.56 Affected patients have a severe mutation and one mild mutation in the compound heterozygous state. Mild missense mutants were targeted to the plasma membrane and retained the ability to form homodimers and heterodimers, suggesting that partial structural and signaling function was preserved. Agreeing with this observation, patients from our cohort bearing mutations affecting the nephrin cytoplasmic domain also had a milder clinical course, and four patients with a more benign presentation had missense mutations affecting the nephrin extracellular domain. Detailed analysis of the genotypes of these patients revealed that two patients were compound heterozygotes for the p.R367C mutation and a mild mutation (p.S724C and p.R743C, respectively), whereas the other two patients had a p.S350P and a p.R586G allele, each in the homozygous state. Both the p.R367C and the p.S350P mutations have been described as severe on the basis of in vitro experiments showing the mutant protein to be retained in the endoplasmic reticulum25; however, both mutations are redirected to the plasma membrane by chemical chaperones.26 This suggests either that the subcellular distribution of the mutant protein is different in vivo and in vitro or that unknown modifiers may play a role in targeting the mutant protein to the plasma membrane under physiologic conditions. The p.S724C and p.R743C mutations are considered to be mild because the resulting proteins are targeted to the plasma membrane.25 Consistent with our observations, p.R367C in the compound heterozygous state was recently described in association with a mild mutation (p.E121K) in two patients with childhood-onset FSGS and preserved renal function at 7 and 15 years of age.57 Finally, in vitro subcellular localization studies showed that p.R586G was also directed to the plasma membrane (data not shown), in agreement with the hypothesis that a milder outcome arises from a milder genotype including at least one mild mutation preserving the plasma membrane location of the encoded protein. In conclusion, CNS is mostly due to nephrin and podocin gene mutations in the non-Finnish population. Patients with nephrin gene mutations differ considerably from those with podocin gene mutations. Disease onset generally begins in the first week of life in patients with nephrin gene mutations, generally requires preemptive nephrectomy, and progresses to ESRD by the age of 3 years. Conversely, patients with podocin gene mutations usually present NS later in the congenital period, and progression to ESRD occurs later in childhood. Histologic features of kidneys, such as PTD, may be used to distinguish between these two groups of patients. Mutations in genes implicated in other hereditary forms of NS are rarely responsible for isolated CNS. In one fifth of the patients with CNS, the underlying genetic cause remains unknown, confirming the genetic heterogeneity of this syndrome among non-Finnish patients. A milder clinical course in patients with nephrin gene mutations arises from either biallelic mutations affecting the cytoplasmic domain or a milder genotype consisting of two missense mutations, at least one of which preserves the structural and functional properties of the protein. Common nonsynonymous variants of the nephrin gene may play a pathogenic role, and further investigations of this aspect are required. Genomic DNA was isolated from peripheral blood by standard methods after informed consent had been obtained from affected individuals or their parents. For sporadic cases, the complete coding sequence and exon–intron boundaries of the NPHS1 gene were amplified by PCR and directly sequenced. We screened for NPHS2 mutations in all patients in whom no mutation in NPHS1 was detected. Screening for mutations in the WT1, LAMB2, PLCE1, COQ2, PDSS2, and NEPH1 genes was carried out for patients without mutations in NPHS1 and NPHS2. Patients with familial cases were subjected to linkage analysis for the NPHS1, NPHS2, LAMB2, PLCE1, PDSS2, COQ2, and NEPH1 loci before sequencing. Linkage analysis was performed with the following microsatellite markers: NPHS1 D19S225, D19S425, D19S610, D19S608, and D19S224; NPHS2 D1S3760, D1S215, D1S3759, and D1S2751; LAMB2 D3S3640, D3S3560, D3S3629, and D3S1573; PLCE1 D10S185, D10S1680, D10S574, and D10S1726; PDSS2 D6S1593, D6S1698, D6S1592, and D6S268; COQ2 D4S2922, D4S395, D4S1538, and D4S1534, and NEPH1 D1S2721, D1S394, D1S2635, D1S484, and D1S2675. PCR and sequencing primers for NPHS2, PLCE1, and LAMB2 have been described elsewhere35,37,42; primers for NPHS1, WT1, COQ2, PDSS2, and NEPH1 are available upon request. PCR products were sequenced with the BigDye Terminator cycle sequencing kit and analyzed with an ABI Prism 3130xl DNA analyzer (Applied Biosystems, Foster City, CA). We analyzed the segregation of mutations with disease by direct sequencing of DNA from all available family members. Nonreferenced missense mutations were screened by direct sequencing in at least 100 unrelated control subjects of matched ethnic origin. In silico analysis of missense mutations was performed with PolyPhen software (http://genetics.bwh.harvard.edu/pph/).61,62 Splice-site variants were evaluated with NNSPLICE 0.9 software (http://fruitfly.org/seq_tools/splice.html). All values are expressed as median and range. Comparisons between continuous variables were based on the Mann-Whitney U test or Kruskal-Wallis test, as indicated. For categorical variables, we tested for differences in proportions by χ2 or Fisher exact test, as indicated. All tests were two-tailed. P < 0.05 was considered significant. Estimates of kidney and patient survival were obtained by the Kaplan-Meier method, and survival curves were compared with the Wilcoxon test. Statistical analyses were performed with Minitab 13.0 software (Minitab, State College, PA). This research was supported by the Programme Hospitalier de Recherche Clinique AOM02123, the Programme Maladies Rares INSERM/Association Française contre les Myopathies (4MR02F), the Association pour l'Utilisation du Rein Artificiel, and the PodoNet (Clinical, Genetic and Experimental Research into Hereditary Diseases of the Podocyte) project of the 2007 E-RARE program. This work was made possible by an International Society of Nephrology fellowship awarded to E.M. and a Fellowship Training Award to G.B. by Fonds de la Recherche en Santé Québec. We thank the physicians who provided samples and clinical information for this study (Supplemental Appendix 1).